Libbtunes disc jockey provides New England Wedding DJ MC services. Reunions, oldies parties, and anniversary celebrations. Delighted Customers: Below you can browse through some of the customer testimonials submitted by Libbtunes Entertainment's very satisfied customers. Their contact information and additional testimonials with contact information are also available upon request. Everyone Was Dancing -- Even the Wait-staff! When my (now) husband and I began the wedding process, we had an idea of what we wanted our special day to be like, and Bob hand-delivered that perfect day for us and proved instrumental in our entire planning process. Bob's level of organization and specificity made it impossible for us to end up with anything other than what we wanted, and knowing that our wedding was in the hands of an experienced professional was such a relief! What I will remember most about the music at our wedding is how very "us" it was! My husband and I could not have more opposite tastes in music, but Bob somehow managed to bring together the two styles so seamlessly that everyone was dancing -- even the wait-staff! The day was so beautiful and we have such fond memories to last us throughout the years. He really made everyone happy, and us most of all! I can't imagine the day without Bob's vision and execution! I wholeheartedly recommend his services! Bob, you did such a great job at our wedding. I couldn't have asked for anything better. All the guests were very happy with the music selection, sound quality, volume, etc. and so was I. Everything went very smoothly and you were very cooperative with me. I appreciated your promptness, easy and quick communication, and thoroughness. Your level of professionalism was superb and you had a great personality for my guests and type of event. Everything was fabulous! Thank you so much for making our special day that much more memorable! Posted by the customer on the "Knot"
Bob Libby is a “Pro”! My buddy used Libbtunes for his wedding so I have now had the chance to attend two weddings with his services, including my own! Bob is a master and will walk you through the process front to back, making suggestions to improve the flow that you might never consider. Most important, everyone was dancing from the get go until we were being kicked out at the end of the night. That's what makes a wedding DJ great. Our Families and Friends Got On The Dance Floor and They Stayed There All Night! * On a scale of 1-5 (1=lowest, 5=highest), we rated our overall satisfaction with Libbtunes Entertainment a 5. We were one hundred percent satisfied with our Libbtunes experience. You can tell that Bob has a lot of experience. He was a pleasure to work with and he helped us make the night unforgettable. Months after the wedding, people were still telling us how tasteful and fun the music was that night. Our families and friends got on the dance floor and they stayed there all night. Bob helped us develop our vision for the music and he executed it perfectly at the wedding. It took some work on our part but the end result was exactly what we wanted. He worked very closely with us on the timing, types of music/songs that we wanted played and didn’t want played, and he even had us specify how we wanted him to interact with the guests. With Bob you are getting both an entertainer and a consultant. If you hire him and use his process, you will get the result you want. Thanks to Bob the floor was packed the entire night. We had music from Country to Salsa to Sinatra. The music transitions were absolutely professional. Thanks you for a great night! Bob. You’re welcome to share our comments, and we will certainly recommend you to others. Posted by the customer on the "Knot", Bob from Libbtunes was organized and professional. He has the experience to recommend music or you can set your own play list using his vast music library and on-line portal. We were very pleased to have selected Libbtunes as our wedding DJ and would highly recommend him to others! Thank you so much for everything! We were so happy with all the music and all of our guests had a great time. They were dancing all night, there was a good mix of music and everything with the kids worked out perfectly! Also, thank you for the pictures and being the MC. The timing of everything worked out really nicely from the introductions to the last dance! We also enjoyed the upgraded Cylindrical BOSE sound system - thank you! I have already submitted a comment through Gigmasters for you as well as added you to our preferred vendors list here at the hotel. :-) Thank you again. We were very happy with all you did to make our wedding day perfect! Obviously, I will highly recommend you to anyone I can. See you in November at Katey and Tommy's wedding. He Got Everyone On The Dance Floor! Bob was professional in manner & appearance, accommodating, great enthusiasm with a comfortable speaking tone - great with the wedding party introductions (no mistakes as I have seen at weddings I have attended!) - got everyone on the dance floor by feeling out the crowd with the type of music they enjoyed - kept the wedding going on a nice flow – I would recommend Libbtunes for any sophisticated event. On a scale of 1 to 5 (1=lowest, 5=highest), I would rate Libbtunes Entertainment a 5. I Had The BEST Time At My Wedding!! Hi Bob, Thank you so much for the most amazing evening!! Everything from start to finish was exactly how we had envisioned it. The speech you gave for my deceased father was exactly what I was looking for. It was touching but did not bring down the mood of the party. You controlled the crowd and the timeline perfectly. The dance floor was packed the entire night for both fast and slow music. Guests kept coming up to me and telling me how friendly you were and that you were really great about playing the songs that they requested. I especially appreciate how understanding you were when the venue messed up our end time. I was pretty upset but you helped calm me down and smooth out the situation. It was the most fun and amazing night of my life. Thank you SOOOO MUCH for everything and for making the night go smoothly and for being a really fun, personable DJ. Nick and I thank you from the bottom of our hearts and we are so glad that we chose you. Seamlessly Put On a Great Show For Everyone! Thanks again, Bob. You were great in planning, coordinating, and providing good music during our wedding. You handled some of our last minute changes seamlessly and put on a great show for everyone. We would gladly recommend your services to anyone. You were professional, entertaining, and a pleasure to work with. Thanks again for being a part of our wedding. By Far The Best DJ I've Seen! We were so happy with the excellent job you did as a DJ at our wedding! I have been to many events with DJs over the years and you were by far the best! You kept the party going and people dancing all night long. You helped make our wedding night so special. - - Hope you are doing well and thank you again for everything! Testimonial From: David & Jennifer Radin Bob was the perfect wedding DJ. I knew our wedding party would be fun, but I was so surprised to see everyone on the dance floor ALL night! My friends and guests filled the dance floor until the very last song. In fact, Bob even played an additional song after our last scheduled dance because everyone was having such a wonderful time. He played the perfect mix of song after song that kept the party going. I also want to mention the high quality Bose cylindrical sound system that was easy on the ears sounded awesome. I have been to so many parties where the DJ uses speakers that are hard on the ears and just don't sound good. He definitely has the best equipment I've ever seen. Bob is very organized and we planned out the whole night of music in advance. His website was easy to use to create a playlist and an equally important do not play list. He played all the songs on our list and even played them during the times we requested (cocktails, dinner, dancing). Overall he is a true professional and a real pleasure to work with! We would hire him again and recommend him to family and friends. From: Carey & Heather Neal. From our introductory phone call to the last dance at our wedding, Bob Libby was kind, accommodating, and professional. During that first phone call, Bob asked us a series of questions pertaining to our wedding and his role in both the ceremony and reception. He helped us clarify our vision for our wedding, and we felt more prepared than we had before the call. Because he was also our MC, he asked us how involved we wanted him to be during the wedding (how much we wanted him to talk, and with how much personality). We told him exactly what we wanted, and that's what we got the day of the wedding. At no point during the planning process did we ever doubt Bob's ability to deliver. On our wedding day he warmed up the crowd, kept everyone dancing, and very politely enforced our rules for the "do not play" list. Bob delivered in every way. Posted by the customer on the Knot Libbtunes Website was detailed and easy to use. Music was fantastic. Everyone danced until we had to force them to leave at 12:30am. Bob was great to work with and was willing to do anything we wanted. Bob was very organized and thorough throughout the planning process and we could tell he takes his job very seriously. He will strive to make your event as enjoyable as possible. This led to a couple misunderstandings leading up to the wedding, but overall, it was smooth sailing. As for the event itself, Bob certainly lived up to the great reviews I read before choosing him to DJ our wedding. He played all the songs we requested and had a great selection of music throughout the reception. The dance floor was packed the entire night. 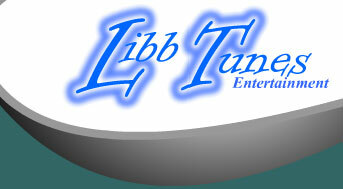 We highly recommend Libbtunes entertainment. Bob Was a True Professional! * On a scale of 1-5 (1=lowest, 5=highest), we rated our satisfaction with Libbtunes Entertainment a 5. He Had Everyone Up and Dancing All Night Long! Hi Bob. - - - - We were so happy with you! You really gave us the night we were hoping for. You controlled the crowd and the timeline perfectly. I'm so glad we chose you to MC our reception. You made everything easy for us and that is exactly what we were looking for! I just finished leaving excellent feedback on the Gigmaster's site, but I wanted to drop you a line and make sure you knew just how happy we are! Below, I've included the feedback we left on gigmaster's. We would easily recommend you to anyone who was looking for an MC. - - - - - Thanks for an amazing night. Kim Carlton and Chris's Feedback to Gigmaster's: Bob was awesome! All we did was provide him with an extremely general guideline of what we wanted and let him take it from there. We couldn't have hoped for anything better. He controlled the timeline, was extremely professional and was very helpful from the very beginning. He had everyone up and dancing and enjoying themselves all night long. What was great, is that he has the option of "blacklisting" songs and only authorized people get control of the mic. Nice! The Libbtunes service was also extremely reasonable. The night was great and we will highly recommend Bob to anyone! Thanks for a great night and an evening we won't soon forget!! While doing the search for our wedding entertainment, many DJs we spoke with were not willing to meet with us prior to our wedding. Bob was very happy to meet with us before we even booked him! He discussed in detail what he does for weddings and asked us what we imagined our wedding to be. He wanted to get to know us and understand what our expectations were. He wanted to make sure he would be able to not only fulfill our needs...but also make it our perfect day! The combination of facts that Bob was so sincerely interested in making our wedding day perfect and was willing to spend his valuable time speaking with us before we were even definitely hiring him...and not to mention most DJs were charging up to twice the amount of money as he was....were the reasons we absolutely hired him! During the process of planning our wedding Bob was very helpful. His online planning tools were great and easy to use. We discussed the basic set-up plan for the reception venue and he helped by giving us alternative options which created better sound and dancing. He was always looking out for the best for our wedding, not trying to tack on extra expenses, and even leading us to decisions which saved us money. He definitely was trying to give us the best buy for our buck! During the wedding Bob was professional, courteous, and listened to ours and our guest’s requests. He was not obnoxious and over the top as some DJs can be. He kept the flow and coordination of the wedding reception continuously...and he really kept the energy level up throughout the evening. The dance floor was always filled with our smiling guests, and everyone really had a great time...including us! The most fun filled wedding ever!! Hi Bob,- - - Thank you again for working with us on our wedding. We have had so many of our guests tell us that our wedding was the most fun filled wedding they had ever attended. We had an absolute blast ourselves and we will remember the day forever. We get a kick out of how many people have said to us how all our choices, including our music, was goofy, sentimental, touching yet fun, but most of all how appropriately "knowing us" everything was, and you were a big part of it. A couple last points: we really appreciate you working with us on a couple of those last minute changes. We also found your website to be quite useful in not only helping us plan, but also inspiring us and pushing us in the right direction for appropriate music choices. Thanks again and we will recommend you to our other friends and relatives who get married, just like Kathryn and Brian recommended you to us. "Our guests say it was the best wedding they've ever gone to"
Hello Bob. - - - Everything went extremely well at our wedding. You were complimented many times by our guests. Today we are still hearing how our wedding was "the best wedding they've ever gone to". And yes, we are a bunch of party goers. The wonderful cd you burned for us has been played over and over and over again. Thank you so much for being our DJ and helping to make our wedding great!! Hi Bob! Below is what we’ve posted on Gigmasters as well! You were fantastic and all of our friends and relatives have been going on and on about how much fun they had. Bob at Libbtunes was FANTASTIC! We had a packed dance floor all night long and our friends and family members continue to tell us how much fun they had at our wedding and how great our DJ was! He was both professional and fun and we couldn't have asked for anyone better to kick off our reception and keep it going! When the last dance of the night was called nobody wanted to leave! Thanks to Bob for helping us to have a very memorable and fantastic evening! You did and awesome job introducing the wedding party! Dear Bob, - - - Thank you so much for doing a wonderful job at my wedding. I know it was difficult getting in touch with us the week before the wedding to finalize the order of events due to Mike being in and out of the hospital, but you were able to pull everything together for us, and that helped me a great deal. It was really one less thing we had to worry about. It was a perfect day and even though we were running behind schedule you were very flexible throughout the ceremony and able to change how the flow went at any moment. You did and awesome job introducing the wedding party as if they were a basketball team (which we requested), you did a great job! And the crowd thought it was funny and made the intros more fun. Thank you so much, you did an awesome job and I would absolutely recommend you. You’re easy to work with and very responsive to any problems that arise. And your pricing was also very affordable. I had So much fun dancing! Dear Bob, - - - I wanted to thank you for the wonderful job you did at our wedding! My bridal party and I had So much fun dancing. You did a perfect job reading the crowd and moving the event along smoothly. I was also excited when you gave us a CD with our wedding songs on it- it was a very nice touch. Thank you again for making my wedding so much fun! I will definitely recommend you to people in the northeast. You were all about Aaron and I! You were wonderful! You were all about Aaron and I, and trying to make our wedding day a day we would never forget!! You were very dedicated to us and I know I had fun and my family loved you! The night was filled with such magic! Dear Bob, - - - We wanted to thank you for the great music you provided at our wedding. The night was filled with such magic and spectacular dancing! We have the pictures to prove It! You were so easy and efficient to work with. You answered all of our questions and assisted behind the scenes to make sure everything was set-up and ready to go. We will certainly recommend Libbtunes to anyone who is looking for an excellent DJ. Feel free to list us as a reference. Thank you so much for the great job you did for our wedding. Even though we did not meet before hand we had such a great rapport over the phone that I felt completely comfortable with entrusting you to guide Andy & I through the planning process. And I was thrilled at how everything came together on the "big day." The flow of the reception was seamless - several of our guests commented on how well you kept the party going. I had an absolutely great time, and a big part of that was due to your experience and ability as a DJ and Emcee. I would strongly recommend you to anyone planning a wedding. Thank you again so much for everything you did for us on our wedding day. We had SO much fun, especially in the last hour with just the "hard-core" friends and family there. Even though our friend Kristen recommended you to us, she was not at the wedding, but she asked how we liked you, and I told her you were the best! You really were such a pivotal part in making our wedding day perfect. You kept in touch with us throughout the planning process, always making suggestions, but never ever being pushy. Always professional, but so easy to talk to! Being that we had some unique songs for our wedding, you did your best to find them if you didn't already have them in your collection. On the wedding day, you kept us up-to-date on the timing of everything and made sure all went smoothly. And you kept us and all the guests dancing, all the way to the end of the reception (and probably a little bit later!) On top of all that, you were the most reasonably priced emcee/DJ we found! I'm so glad that my friend recommended you, and now we wouldn't hesitate to HIGHLY recommend you ourselves! Thanks again for everything! The BOSE Cylindrical Sound was great! We loved the night. You did a great job. Thank you sooo... much and we will listen to our CD over and over again I am sure. Everything went perfect. The BOSE Cylindrical speaker was great and everyone kept saying that the music was great and just the right level of sound. Thank you so much for helping make our night perfect. We would certainly recommend your service to others. And you can also add our name to your list of references. A Libbtunes story has become folklore in our families! When we first contacted you we shared with you that we had two goals: 1) get married; and 2) keep the dance floor full from start to finish. We took care of the first and you took care of the second. It was clear to us from the moment we first spoke that you took immense pride in your job - you addressed and resolved matters that we had not even considered (and then you followed up on those on the day of the reception). In addition to your notable professionalism, you were also a realist. It rained approximately five inches in the days surrounding our wedding (originally planned to be primarily outside), yet you worked with our reception site to ensure the rain never interfered with our goals of keeping the dance floor full. We recognize that this was not a simple task, but my goodness was the final product a wonderful thing. As for the event itself --- though we had comfort that you would be terrific, you still managed to exceeded our wildest expectations. You did such a terrific job, that at one point you actually had to leave the DJ booth (outdoor temporary platform on painters scafolding with plastic covering) for fear that the platform would collapse from everyone jumping on the dance floor! That has become folklore in our families! We have not talked to a single person who did not have an incredible time. The music was so good that Josh's great aunt and uncle, who are each 90, stayed the entire night just to watch their nieces, nephews, great nieces, great nephews and everyone else dance...then, for the final dance they got up and danced together. This was a very powerful moment that probably would not have happened if you had not helped us throw such a wonderful event. Finally, thank you for the CD. We have already burned it onto our iPods to listen to the music while we work out. It triggers fond memories of a great time. Thank you for all you did to help us have such a wonderful day. You were awesome at the wedding!! Everyone was dancing and having fun. . . and trust me the people you got to dance don't usually dance!! We had a wonderful time!! I also want you to know that you were so helpful with keeping track of the time!! The day FLEW by and we didn't miss one thing we wanted to do because you made sure everything was on-time!! I also want to tell you how much we appreciate the extra time you put in, in the end!! You really did make our wedding memorable!!! Thank you so much for everything Bob!! Every detail was handled with precision and care! From the moment we first met him, we knew Bob was the right DJ for us. He is professional, prepared, poised, and while highly accommodating to our interests, had top-notch advice from his immense experience to make our wedding operate more smoothly. From the ceremony which he provided AV for, to the reception with the dances, the toasts, the microphones, calling tables to the buffet... every detail was handled with precision and care. Even though we got rained out towards the end, he made quick work of packing his outdoor equipment and making sure there was music for the indoors. He was gracious to us and to the guests, and a pleasure to have around. I could not have been any happier with our selection of Libbtunes for our music. He was gracious and accommodating. It was everything I wanted it to be for our golden anniversary. I highly recommend Bob. Thank you so much for making are wedding that much more perfect. Everyone has said how much fun the reception was and I really think it was because the music selection literally filled the dance floor. I think everyone at one point or another was dancing! Every genre of music was played and that was exactly what we wanted. We will recommend you to everyone! I hope you enjoyed it as much as we did. Thank you again! Bob was great. He played all the songs we had asked him to. He contacted us on several occasions and asked if we had any questions and made sure we had everything we wanted. The guests had a blast. They danced from beginning to end. We used his new BOSE speakers and they sounded great. The music was not overbearing as it sometimes can be. We would recommend Libbtunes Entertainment in a heartbeat. Thanks Bob. We all had a wonderful time. On a scale of 1-5 (1=lowest, 5=highest), we rated our overall satisfaction with Libbtunes Entertainment a 5. Our wedding was very low key (by design) and not a huge dancing wedding. We did however, have a few that wanted to and Bob made sure that they were entertained. We also had quite a bit of last minute changes as well as alternate ideas that we had that we would not know about until the time of the reception, Bob Libby was very accommodating to these needs and kept tabs with us to ensure that everything went right. We also did not want a game show host, as I said a very low key wedding, Bob was energetic when he needed to be - such as introductions, and then toned it down when it wasn't needed, just the right levels. Essentially it was perfect. Thanks a million for a great time. I must admit I was hanging in the breeze on this one because I picked you to DJ and you were $300.00 less than the other DJ's we looked at so if you tanked at my wedding I never would have heard the end of it. However, I must say it’s a solid week after my wedding and I'm still getting calls from guests saying how much fun they had dancing. You did a great job reading the crowd and playing music for both young and old. Your year’s of experience has truly paid off both as a DJ and MC. Thanks Again. Just wanted to send a big thank you for everything you did for our wedding. I was initially very nervous about planning a wedding from a distance (Colorado to Massachusetts). However, you returned every single email and phone call in less than a day. Despite the difference in time zones I never had a problem with communication. You were by far the easiest person to work with of anyone (the caterer, the photographer etc). I never once worried about your reliability and knew you would complete everything just like I asked. You made me feel completely confident! You made our wedding day go so smoothly, managing the timeline perfectly! You kept the guests smiling and entertained (I've gotten great feedback), and you played a great mix of music for all ages. I would hire you again in a heartbeat and recommend you to all friends who are getting married. I would love to post a “big thumbs up” on your website! How do I do that?? THANKS for being part of our wedding day! Also thanks for the CD. I've already listened to it several times while trying to organize our new place! Hi Bob, Thank you for helping make our wedding day so special. We had a great time and so did our guests! I was so pleased to see how many of my guests were dancing throughout the night. These guests are all big dancers anyway, but your music selection certainly kept everyone on their feet. I knew we were having a great party when I saw my 86 year-old grandfather and his two brothers (similarly aged) up dancing to Bon Jovi! That may have been my most favorite memory of our reception. Leading up to the reception, I really appreciated your attention and help choosing some of the song selections for the "special" points in the reception. Your experience definitely enabled you to offer great advice. I would definitely recommend you as an emcee to anyone looking for a fun, yet classy evening! It has been two months since the wedding and we are still receiving compliments about the great party. Many said it was the best they had ever attended. One guest commented "you'd have to be dead not to have fun at that wedding" - and we credit Bob Libby of Libbtunes for the success! His upfront planning and suggestions for event timing, song selection and coordination with the photographers were indispensable. The execution of the emcee function was flawless. He was responsive to ALL our requests including an "on-the-fly" change of a song from the No-Play list to the Must-Play list (but only at My request). In short, we will hire Bob for our next function and very highly recommend him for anyone planning theirs. Posted to Gigmasters: All top ratings in each category. I cannot begin to tell you how easy you made our preparations concerning the music for my parent's 50th wedding anniversary. Being in business myself you can understand that I was somewhat apprehensive when you said that you would not mind any calls, or emails concerning the planning for this event...no matter how many. Boy did you stay true to your word!!! Not only did you help in our selection of music (which we were not very familiar with), but you were a huge aid in the coordination of the celebration. We can't thank you enough. The music was great, our 100+ guests, and most importantly, my parents had a wonderful time. You had plenty of flavor to satisfy folks from 80 yrs old, down to 8. I think you would be pleased to know that several of the guests were quite interested in using you at their future venues as well. You were professional, courteous, on time, and went past fulfilling your duties. You did an awesome job at our wedding. People from our parents, to my middle age family members to the early twenties kids that were left at the end all kept telling us what a great job you did. I think the highest compliment came from my brother who is 26, he said that we should keep your contact information for when he gets married, and he doesn't even have a girlfriend! The 3-13 year olds loved you, my 3 year old nephew especially who wouldn't leave the dance floor until his mother dragged him off, and sponge bobsquare pants was a big hit. Hiro and I also loved it, we never thought we would be dancing so much at our reception, even when we planned to go mingle, the next song was always too good! Thanks again Bob, for making our wedding amazing and doing such a great job organizing our confusing and large families. Just an added note, I thought it was amazing that you stayed in your tuxedo jacket well into the sweltering night until I happened to notice and told you to take it off! You definitely take professionalism to another level. Best wishes for the future and thanks again for all your hard work! I can't express to you enough how much we enjoyed you joining us on our special day. Jed and I were able to spend an amazing night with our two families joined together. You were amazing- very helpful throughout the process of planning and then in the final night. You initiated a great friendship weeks before our party, and wanted to meet our needs on the special day. We had so many compliments on the music and how we had such a wonderful DJ, Jed and I will forever be grateful for your services. As we sit here together in his final days before his deployment to Iraq , We sit back and realize what a wonderful day/night you had given us- A day we will never forget. It's all about what you want for your celebration. Libbtunes is a PROFESSIONAL! At first, I wondered about the Libbtunes contract; but having heard the nightmares about other DJs from other's experiences, I have no doubt that I got the right DJ. I had a fantastic Caribbean style wedding. I can't tell you how many stories I've heard about DJs disregarding the customer's desires. Not Libbtunes! In fact, Bob got a feel for all the music we requested and was able to insert other similar genre tunes that I can't believe I didn't think of. I forgot Belafonte!!! Duh! But Libbtunes didn't!!! I loved Libbtunes and how he made my celebration music happen. Libbtunes can make it happen for anyone! Lastly, I highly recommend Libbtunes Entertainment. Owner (Bob) is quite communicative and a real person. He confessed to enjoying our Caribbean style wedding and I did see him appreciating his ability to make others enjoy the celebration as well. As a photographer, Libbtunes also has a photographic eye. Yes, everyone has a digital camera and will send you hundreds of photos, BUT Bob was right there to capture all the best angles. PS: Bob, we got the DVD you made us and had a blast watching it and laughing. Thank you very much for a job well done! It's true that we really now how to throw a party. We had the enthusiasm, but you brought the energy and the talent to make the event go over the top! We were very pleased with your professionalism and with your willingness to work with us. You really know your music, and worked well with our committee to put together the kind of “doo-wop” that our classmates wanted. You even made our in-house Elvis (that would be Tim) drool. We can't thank you enough for your effort and your willingness to go the extra mile. You were dynamite. You were fantastic. The classmates loved you and we would highly recommend you. Thank you again for helping us to enjoy a very memorable 40 th class reunion. Mark and I both want to thank you very much for all your help with our wedding reception. You were definitely a hit among our friends and relatives! All our guest commented that this was the first reception they went to that was both fun and relaxing. They could dance and visit with others without yelling to be heard and they were not harassed to dance every song. You were not only wonderful as a DJ but also a good wedding adviser and planner. I will absolutely use you again. For Mark and I…. you made our reception everything we dreamed of and we thank you! Best wishes for success to you Bob and take care. reception. All the planning in the world can't prepare you for how things actually unfold. I'm so glad you were there. Before and during the event, you were a pleasant and calming force. I had no worries about the music, and with good reason. I'll never forget your smiling face appearing at the cocktail hour and peeking out from the corner downstairs (hey, Buttercup is on the radio as I write this, now it's Piano Man!). Instead of you mailing the photo package you prepared, can we come pick it up at your place? In the blur of the end of the event, I never got to give you the hug you deserved! Let me know. Yankee Clipper Inn, Rockport MA. You Rock! People are still coming up to me and telling me that they had the best time at our wedding. Thanks for the great sound, but most especially "running the show". Your preparation before the event made it really smooth. Being the groom, I didn't think I was supposed to have as much fun as I did, and the mix of music was key! I just watched the video, and can't believe how many people were dancing at the reception (which was one of Lynne's biggest concerns). I know we were a little picky with the Dos and Don'ts, but you nailed it! I have picture of my aunts on my mom's side of the family dancing with cousins from my dad's side, and most of them had never even met! Thanks for keeping every one entertained, it really made it easier for us to be able to enjoy ourselves!! I'll be in touch for our next event! Thanks for being there for us as the MC & DJ of our annual 4 th of July celebration and fireworks presentation. You got a lot of great reviews from a lot of folks. You did swell! Hope you can come back for us next year. Anytime you need a reference, I would be more than happy to provide a glowing recommendation to your prospective customers. We enjoyed your services and music selections at my wife's surprise Birthday Karaoke party. We also caught your act at the Fourth of July festivities as well. My 5 year old was up there boogieing to the beat. Thanks for the great job you did as a MC & DJ for WNDS-TV's 20th year in business Party. We all had a wonderful time and several clients commented that they enjoyed the music from 20 years ago. Thanks again. Bob, Thank you so much for being the MC and DJ for our holiday party at Environmental Pools. Your passion for music and your professionalism shines through. You are already on for next year's party, so be sure to mark your calendar for December 20th! Wonderful Job! Bob, you did an amazing job for our annual block party. We must have called our party "on" and "off" again two or three times! Your flexibility and willingness to work with us made a dreary fall night one to really remember!!! Thanks again - we'll be in touch if we ever need you again! Bob, you were fantastic. We cannot emphasize enough how much we appreciate everything you did to help us plan for our very special day, and then put on a performance that met all those needs. You even met with us before we hired you, and two additional times after we did hire you to help us finalize the plans for our wedding. You were very accommodating to all of our special requests, even allowing us to make changes to the program several times before the wedding. At the reception, you not only led all of the wedding activities in a very professional manner, you played all the music we had requested. You even played a couple of songs to entertain the children, which we thought added a special touch. Everyone we spoke to said they had a great time. We knew that we could count on you to get us through our big day with no worries! If you ever need a reference, please don't hesitate to call on us. I just want to let you know how very satisfied Marc and I were having you as our Emcee and Dj for our wedding day. You were absolutely “Great”! You were also able to stay within our budget, and your variety of music was excellent. You also gave us lots of ideas and suggestions prior to our wedding, and helped us with those special moments in the reception. My brother is getting married next year and was so impressed with your services that he will be hiring Libbtunes Entertainment for his reception. I highly recommend you as a DJ for any type of function. Mike and I just wanted to thank you for everything you did at our wedding at the Rockport Country Club.....you were great!!! I appreciate how late you stayed and how much thought and planning you put into to making my reception music the way I wanted. My family and I had a blast, and my parents wanted me to thank you as well. If you ever need a reference-I would be happy to give you one. If anyone is ever looking for a Master of Ceremonies and DJ, I will send them your way.